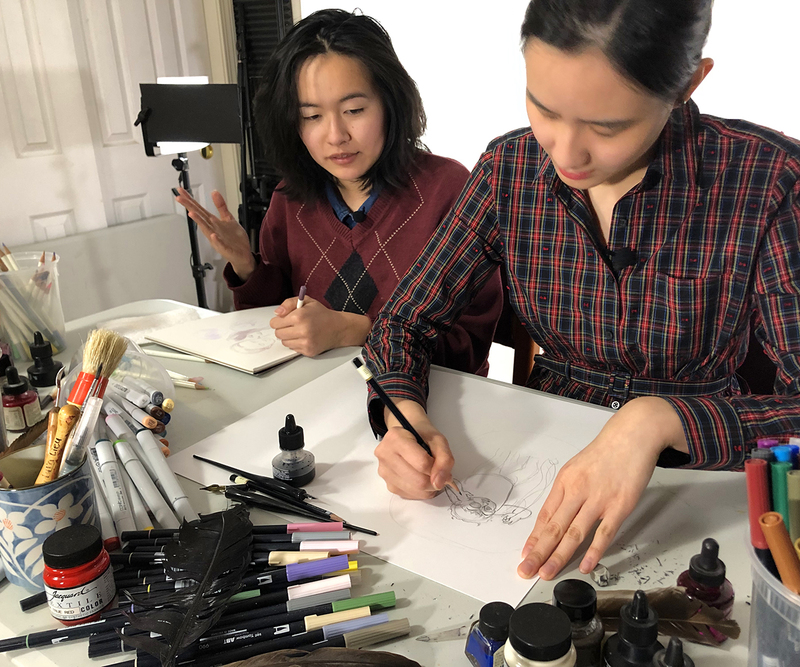 We had a packed day this past Sunday, shooting our upcoming character design tutorial with Teaching Artists Cat Huang and Julie Benbassat. I studied Illustration during my undergraduate study at RISD, but I have to this day, never done a professional illustration job and have no plans whatsoever to try in the future. (I’m 100% a fine artist through and through, that I know.) That’s why it’s was so much fun for me to listen to Cat and Julie discuss character design for this tutorial. Julie and Cat had so much expertise to share, but their friendly banter was also hilarious to watch and made the ideas they were communicating stick more. (you can’t fake having fun!) Somehow, during the tutorial, Cat and Julie managed to mention and discuss Dale Chihuly, “17 pandas,” a T-shirt logo that looked like a bra, a cravat that was mistaken for a corvette, and more! (confused? You’ll have to watch the tutorial when it’s released) While art education is number one here at Art Prof, we also managed to sneak in some silliness too. Not only are the two of them are able to create characters and worlds, but they can both draw entirely from imagination and create a convincing image. I have never, ever been able to draw entirely from my imagination, so I got a lot of insight into the creative process for designing a character. Cat and Julie had so many smart tips to share for designing a character: Cat explained how important it is to start with the story before you sketch the character. If you asked me to do character design I totally would have made the mistake of drawing the character before I wrote the story. Julie shared a simple way to get started with a character: find any object inside your living space, outside, and draw the silhouette of the shape. Then use that shape as the silhouette of your character and design the character from there. There’s more to come in the character design department, this Sunday, Cat and Julie return so that Julie can lead a character design focusing on creatures! Hope you got a chance to do something creative today! 0 responses on "17 Pandas & Dave Chihuly"